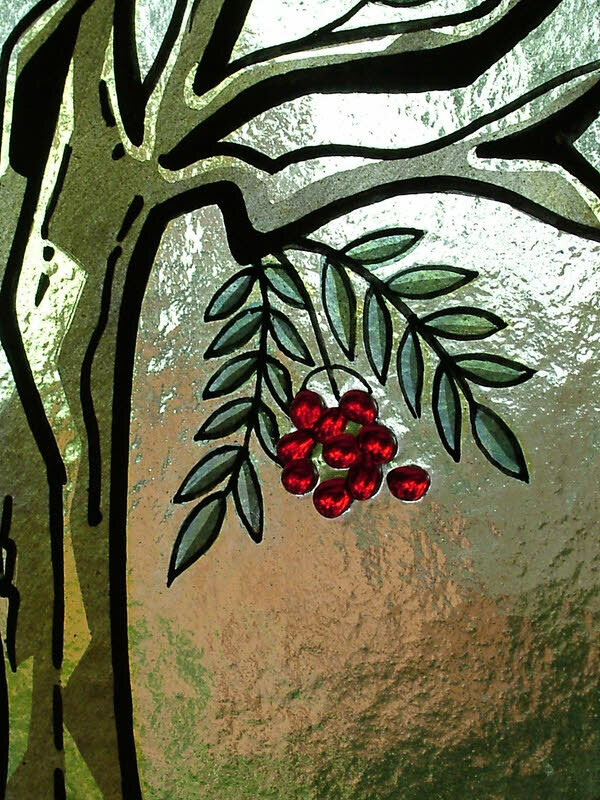 This is a very stylised panel of a rowan tree for a house called… wait for it… “The Rowans”! It is hand painted and fired in the kiln in the traditional and time honoured manner. However I have also included some fusing. I wanted the berries to really glow and so pre fused small pieces of ruby glass to make little round baubles. I then fused these onto my sheet to give this lovely effect. The panel was then leaded together with the border glass and fitted by the customer. Error: Error validating access token: Session has expired on Monday, 08-Apr-19 03:56:55 PDT. The current time is Friday, 19-Apr-19 11:58:24 PDT.